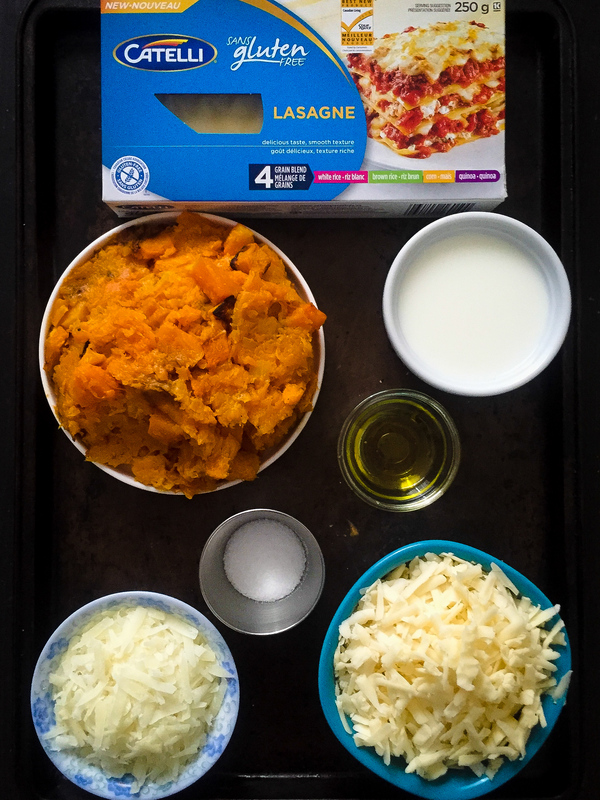 I love making butternut squash lasagna and today’s recipe is a bit different as it uses gluten free pasta. You might be wondering when we became a gluten free household, and the truth is we’re not. We love gluten! We’ve already shared the spaghetti aglio olio recipe we eat every week and our spring asparagus pasta recipe. But not everyone loves gluten and as May is Celiac Awareness Month, Catelli asked us to try its new gluten free pasta. We’ve had gluten free bread that’s so dense it’s inedible and we weren’t sure what to expect. Could gluten free pasta actually taste good? We have friends who are gluten free and it’s always a challenge at parties to bring something that they can eat. At our restaurant, Loka, we’ve noticed more and more guests coming in that are avoiding gluten. This isn’t surprising as statistics show that more than 330,000 Canadians are believed to be affected by celiac disease. On top of that there are even more people who are on a paleo or Whole 30 diet. Lasagna isn’t the only gluten free pasta, Catelli also offers penne rigate, fusilli, macaroni, spaghetti and spaghettini. There’s no cholesterol or preservatives in the pastas, which are produced in Catelli’s dedicated gluten free facility. It was time for a blind taste test. Once or twice a week I bring Dave and his sous chef lunch at Loka, more often than not it’s pasta and many times it’s lasagna. Today I made butternut squash lasagna with Catelli gluten free pasta and no one knew! Turns out gluten free doesn’t have to mean gross. So we figured we’d give gluten- free pasta a shot as it could be the solution for our next potluck. Made with white and brown rice, corn and quinoa I didn’t know if we would be able to taste the difference. Cook lasagna noodles according to direction. In a small pan melt butter over low heat. Add flour and stir to form a smooth paste. Heat the milk in a separate pan. When it is hot but not boiling pour it into the roux (the butter-flour mixture), stirring constantly with a whisk. Cook over low heat until the sauce thickens. If it tastes like flour continue to cook until you have béchamel sauce. To assemble lasagna put one quarter of béchamel sauce on the bottom of 12x12 ovenproof dish. Layer with lasagna noodles then butternut squash, cheese and more béchamel sauce. Repeat layering two more times. Cover with aluminum foil. Cook in oven for 20 minutes, remove foil and cook another 10 minutes. Want more easy gluten-free recipes? Find more on Catelli.ca. What is your favourite quick and easy pasta recipe? Share in the comments below. On other social media? Get the conversation going by sharing your favourite pasta recipe and hashtag #CatelliFamilies so we can find you there too. 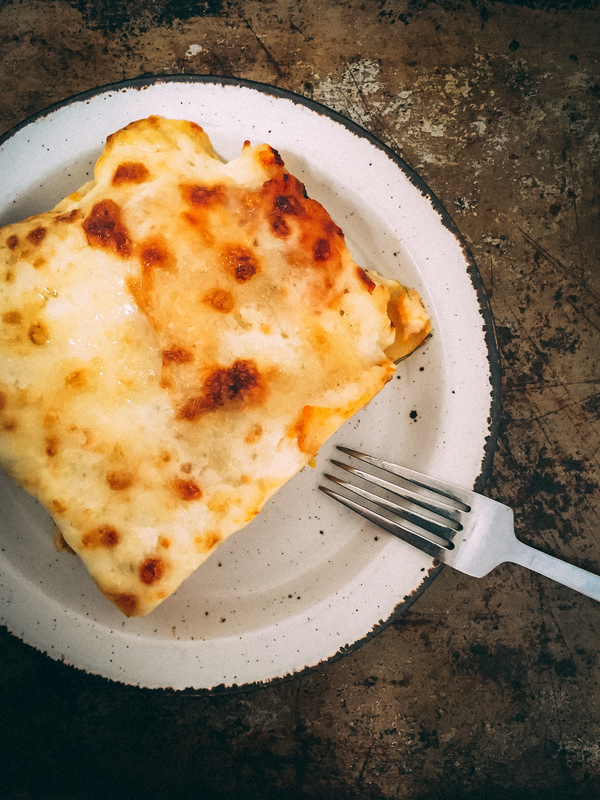 Disclosure: This butternut squash lasagna post is part of a four part series in partnership with Catelli Pasta, a great Canadian brand that has asked us to share our favourite pasta recipes. If they hadn’t approached us we would still be eating pasta 3-4 nights a week. You know, I will admit I wasn’t really into the “gluten free” stuff in the past. However it has come a LONG way. Although I don’t have to eat this way, I do choose to sometimes. I really like gluten free pasta, and often cook it instead of regular. I’m always a bit skeptical of gf products too but this looks and sounds amazing! Bookmarked! Literally just picked up a box of this pasta at the grocery store this morning and put it back down.. Like you and Dave we are committed gluten lovers, but after reading this I will definitely give this gluten free pasta a try! I bet if you did a blind taste test you’d never know! I just bought 2 huge butternut squash and have been wondering what to do with them. This looks like a terrific solution. I’m don’t follow a gluten-free, so I’m likely to use regular noodles. Thanks for the inspiration. I love butternut squash season! I have never tried store bought gluten free pasta as I’ve always been skeptical just as you were. Being a cook by trade myself I would always go through the ‘hassel’ of buying my own gluten free flours and making the pasta myself. This takes abit of work though since you have to hit the right ratio of various flours to get the right texture and taste. This Seem like much simpler solution for the average Joe. I’ll have to give this a try! Fascinating, do you have a recipe for fresh gluten-free pasta? I’ve recently tried Catelli’s gluten-free spaghetti to make Cacio e Pepe for a gluten intolerant friend of mine. Honestly I wasn’t expecting much, having tried disappointing rice pasta and other types of mushy, gluten-free pasta before, but Catelli’s were actually a revelation! Just as you say, it was exactly like the “real thing.” It totally changed my mind about making gluten-free pasta dishes so I can’t imagine how elated those who need to abide by a gluten-free diet must be. Agreed rice pasta doesn’t cut it but I don’t think most people would even know Catelli’s version is gluten free.